For all those that have to do their own accounting, Lodgit Desk offers the option to export all invoice data to a CSV file. If your accounting software allows you can also import this data from the exported CSV file, so that you won't have to enter the data twice. 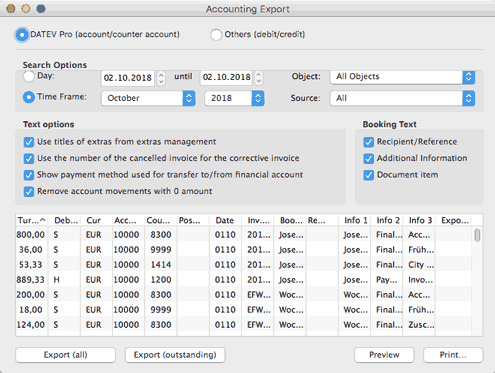 Before you can start using the accounting export feature in Lodgit Desk you will first have to enter the account numbers for payment methods, extras, etc. 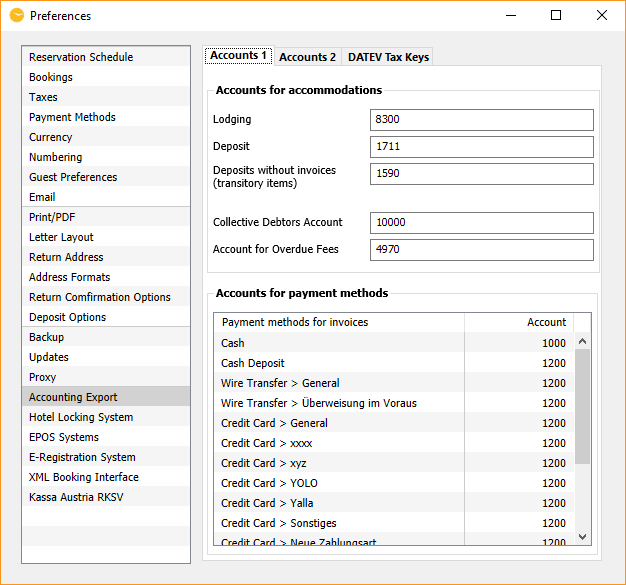 Account numbers for the cash book, accommodations and payment methods can be entered within the preferences whereas the account numbers for extras will be entered within the Extras Management. After you have put in all the account numbers, you can simply continue working like before. Lodgit Desk will book all invoice data to the corresponding accounts in the background. Under "Accounting Export" you can find a detailed overview of all invoice data. There, you also have the option to export this list (in order to import it into your accounting software later). Lodgit Desk will remember which list entries have already been exported to prevent double entries in exported CSV files.